Learn 36 expressions with “get”! 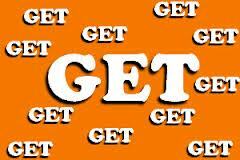 “Get” is a great word in English! It is used in so many different ways. Sarah got to school late and missed her first class. Hurry up! I want to get to the store before it closes. We got a large shipment of books today – what should I do with them? I got this computer just last month, and it’s already broken. That’s a really nice jacket! Where did you get it? I got these shoes in Barcelona.